Forecasts are not effective. The ultimate goal of a forecast is to improve financial decision-making; however, decision-makers are often much more influenced by factors other than the financial forecast. Administrative burden/staffing capacity. Forecasting is just one of many tasks that staff must perform, so forecasting competes for time and energy with those other tasks. Lack of confidence in projections for out-years. As forecasters look further into the future, the forecast becomes more uncertain. 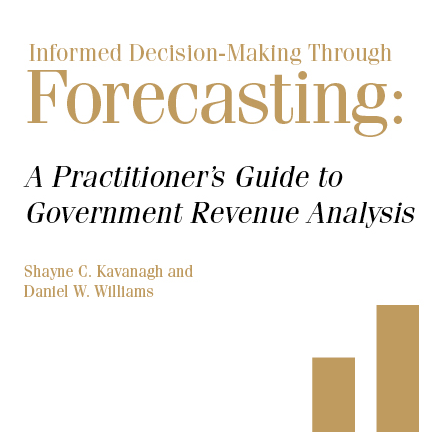 Readers of Informed Decision-Making through Forecasting will learn thatovercoming the above challenges will not often be accomplished by adopting more technically sophisticated forecasting techniques. In fact, in some cases, more sophisticated techniques may only exacerbate the problem, as more complex techniques may further strain limited staff resources and be less accessible and understandable to decision-makers, making the forecast results even less likely to be incorporated into the decision-making process.